The Trinity Church Communion Table Apron in Progress, Dogwood within Guilloche Pattern. A vast number of craftsmen create furniture of all sorts. Many can produce absolutely outstanding works of art from just a few planks of wood. However, only a small fraction of furniture makers also possess the skills of a carver. Stan Saperstein is one furniture maker, who can also carve and sculpt wood. This extra set of skills allows an already unique, but plain piece of furniture, to become even more distinctive. Carving of all sorts is available on any of our furniture. Extending his skills into sculpture allowed Stanley to create ball and claw or lion's paw feet, beautiful scrolls, and raised or relief carving to complete his pieces. Eric, now reaching a journeyman level of carving, and will soon begin practicing the sculptural aspects of furniture. Varying styles allow matching to each period or custom built-in piece. Carving is a conversation piece that lasts forever, and is becoming increasingly rare in furniture today. Almost unheard of in casework, carving makes a standard bookcase come alive with detail. 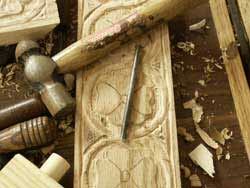 Standard carving templates are available to suit most needs, leaf work, rosettes, vines, and flowers are the most common choices for casework moldings. It is common to choose larger and more detailed carvings for panels, especially those resting over a mantelpiece. Special requests are always welcome; please feel free to offer designs of your family crest, fraternity or sorority insignia, initials, or other personal touches. One of Stanley's son's favorites are eagle relief carvings; dozens of eagle patterns are available. Projecting cost analysis is completed on a case-by-case basis, as we rarely make the same thing twice, our cost variables are always unique. Factors involved are complexity of carvings, any design and layout work required, custom or standard templates, and woods selected. Requirements for painting or burning to provide extra detail also play a role in pricing. We always try to keep our customer's budget in mind, and do not bill for experiments or practice carving on never before attempted designs. 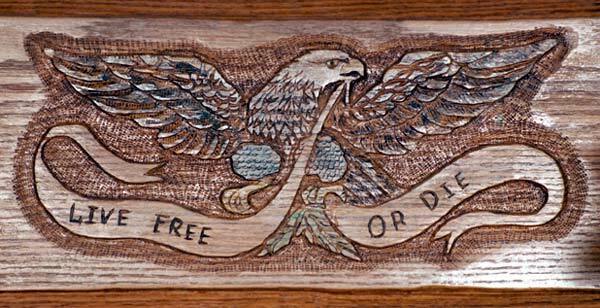 Mr. Saperstein reserves the final right to determine if a carving proposal is feasible to create in wood, and final products are his best artistic representation of the customer's request.